Coloring Enthusiasts Unite On Social Media! Sheri is the owner of Colorist Cafe, a site for coloring enthusiasts and creatives. 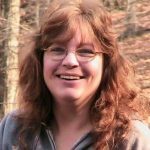 She’s authored several books including coloring journals and unique grayscale coloring books. Her plans are to keep creating, but when she’s not working on book projects, you might find her taking close up pictures of flowers or going on back road rides to falls or fire towers with her husband of 20+ years.